To me, it looked exactly like that. Guess I can be wrong at times. Ah, that looks quite nice, I guess they do look sort of similar. v0.1 is available now. It should work on Desmume 0.9.11, and most flashcarts, anyway, here you go. The patch is xdelta, so you might want to download the patcher if you haven't already. The patch includes World 1, and has saving at castles and towers disabled. I know that it has been a while, but I updated the first post with a link to a youtube version of the 1-5 video, that way it won't be as annoying to watch. I noticed that it has been over a month since I uploaded a patch for World 1 and was wondering why my hack hasn't been approved yet. Is there something that I need to fix? Or is there another reason? If someone could let me know what it is, that would be greatly appreciated. That "Luigi Time" text on the title screen looks somehow blurry; it needs to be improved a bit. Yes, I know that, but I was meaning are there any gameplay issues, not quite graphical issues, seeing as the one that you mentioned is not really game breaking. It's true the logo needs some more work tough, the Mario World ripped letters and the 'Luigi time' text both seems to have been quickly resized to fit on the screen. And the 'New' lacks a shadow compared to the rest. Then I guess I'll change it for v0.2, even though I spent over 2 days working on it. It has come to my attention that the v0.1 patch might not be working for some people, including myself(due to an xdelta input/output error), so I've decided that the first thing I will do after I get my computer back(hopefully in a couple of weeks) and upload a couple of videos for World 2, will be to release a new version, dubbed v0.2a, where saving and travel between the different worlds will be re-added to prevent the error from occurring again(I hope). Here is a look at the new version of the grassland tileset that I worked on this weekend, thanks in part to my sister, who let me borrow her laptop so I could work on this. 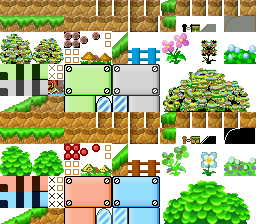 The main ground tiles are the same as the ones from NSMBW, but with an unused ground tile from SMB2/TLL overlaid on top and if you notice, there are SMB3 tiles and SMW tiles, hinting at what to expect in World 2-3, as well as the fence tiles from SMB replacing the regular fence. Also, I have decided to keep some of the original tiles since I kind of like them. Can you show us your new tileset in-game? It looks cool, good job! I'll see if I can after I get home from school today. But since I haven't cleared out the level slot for my next level(which is World 2-4), I'll need to add a view in a level that I have finished that I can use for testing purposes. Here is a video that I just uploaded, read the description for more info. The art looks pretty nice, I like it. That star music is pretty bad though. It sounds like someone tried to transcribe it by ear and failed. Thanks, although, the midi that I used for the star theme sounded fine to me, but I will admit that it sounds a little obnoxious after a while, so I plan to change it sometime in the near future. Maybe an instrument change would work. I decided to make a video of World 2-1 since I didn't really have anything better to do today, so here it is. I really like that level, especially the transitions between beach and ship. 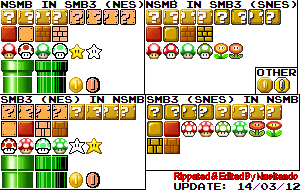 I used that soundtrack also in an earlier version of smb tnw and I can tell that it's not compatible with every soundset, so you maybe will get some problems if you try to make complexer levels with it. The ship was actually a last minute addition to the level, and yeah, I remember seeing a video of your hack with the sea coast music in it, wasn't it the athletic theme before you chose to use the Flower Garden theme instead, because for NSMBLT, it is the beach theme, seeing as it fits a lot better than the other music that I tried at first, one of which was the beach theme from SM3DL. Here is World 2-2, I based it off of my Mario Maker level, Wiggler Plains, and I think that it turned out pretty well. I know that it is a bit soon to have another video, but here is World 2-3, the first retro level in the hack.